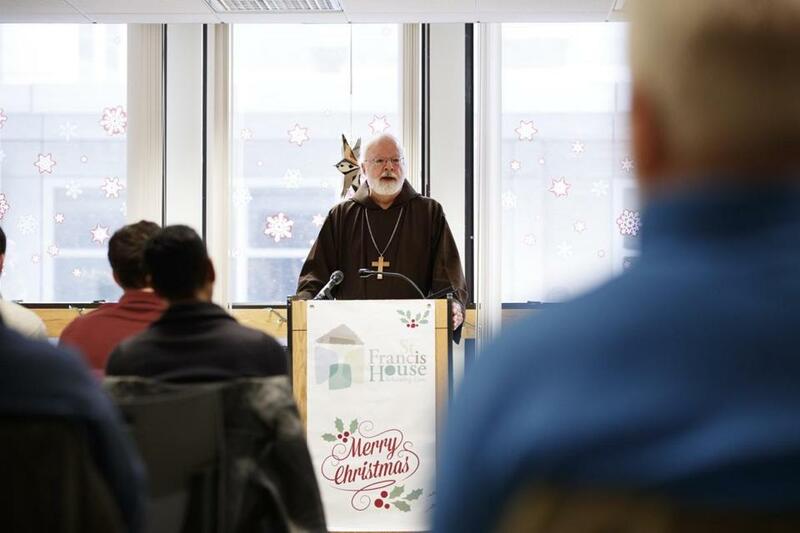 Cardinal Sean O&apos;Malley visited the St. Francis House on Christmas morning and held a special service for residents and guests. On Christmas, gratitude comes in the form of kind gifts, delicious meals, and time spent with family and friends. They’re the secular markings of a holiday held so dear by so many, some for religious reasons, others just out of tradition. But for many guests at St. Francis House day shelter on Boylston Street, gratitude was abundant on Monday for much simpler reasons — the roof over their heads as a snowstorm blew past outside, a warm meal to keep their stomachs full, the hospitality of familiar faces who wished them holiday greetings throughout the morning. Though the shelter is not open overnight, its staff connect their guests to overnight shelters, affordable housing options, access to medical care, and pathways to find work. 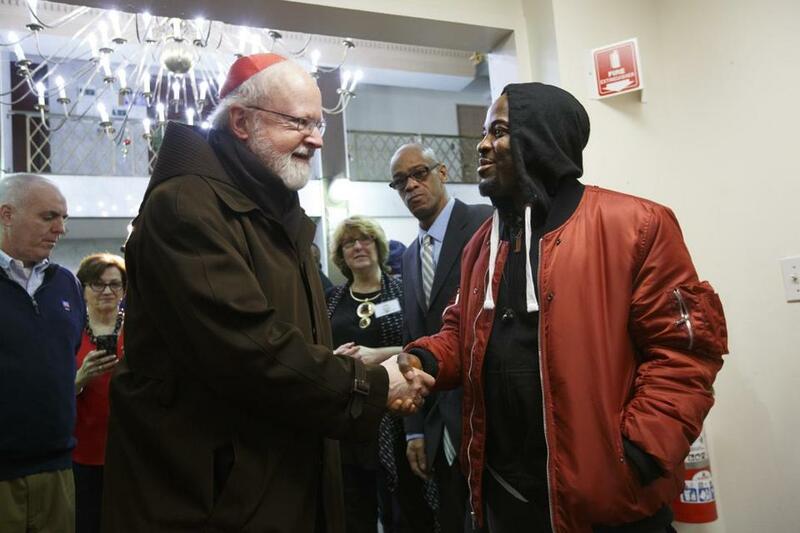 “The great virtue of Christmas is hospitality, making room for God and for each other, in our lives and in our hearts,” said Cardinal Sean P. O’Malley in a sermon to more than 50 members of the St. Francis House community Monday morning. It’s a hospitality that was treasured by guests like Roland Yarpah, a 32-year-old refugee from Liberia who moved to the United States in 2004. This Christmas is Yarpah’s first holiday season without a home. “Being in the city over the year, having nothing, being alone . . . [O’Malley] filled that space within our heart, that desire that someone out there cares for us,” Yarpah said. O’Malley said Christmas is an important time of the year to raise consciousness about homelessness in the community and remind everyone that the lack of affordable housing is still a significant problem. And for those spending their holiday season in shelters, O’Malley hopes to bring the spirituality of Christmas that most people can connect to. Many guests at St. Francis House on Monday were optimistic, filled with gratitude for the kindness they have received and with pride for the accomplishments they have reached this year. Roland Yarpah (right) greeted Cardinal Sean O'Malley. One father raved about his two adult children, beaming as he spoke about their independence, and the confidence he has in himself to get back onto his own two feet. Another father spoke about his dreams to someday return to St. Francis House as a volunteer, rather than a guest, and bring his 9-year-old daughter with him. He had a job interview last week and is hopeful that next year’s Christmas will look different. Lewis Brown, a 71-year-old artist who lost his home in a fire in 2012, carried around a laminated copy of a piece of his artwork, covered in colorful illustrations of birds. He showed it off proudly, and his wife, Linda Myers Brown, recited his website aloud for others to check out. The couple planned to spend the afternoon with Brown’s sister, but they wanted to hear O’Malley speak first. Calling herself “strongly Catholic,” Myers Brown said she has felt taken care of by the city’s churches and finds comfort in spirituality. Though she and her husband would appreciate a home to call their own, they don’t truly “want for anything,” she said. Karen LaFrazia, president and CEO of St. Francis House, said she hoped Christmas would make the shelter’s guests feel the same unconditional love and hope that most people feel during the holidays.